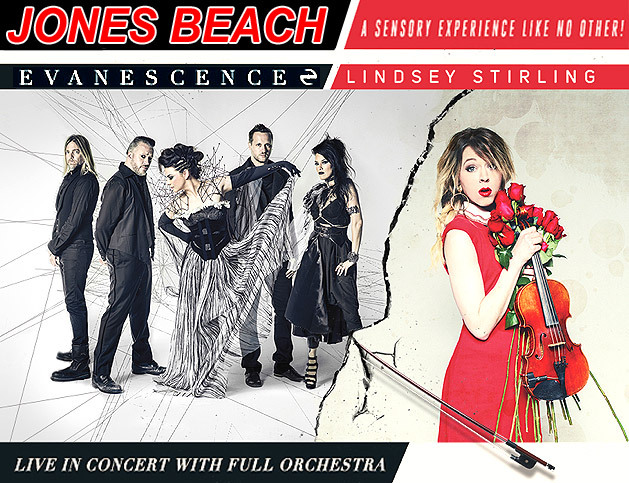 Evanescence and Lindsey Stirling are teaming up for a joint summer concert tour of amphitheaters in 31 U.S. cities that will feature both acts performing with an orchestra... Headed by singer Amy Lee, Evanescence has two Grammy Awards to its credit. The band’s 2003 debut album, “Fallen,” has sold more than 17 million copies worldwide. Its most recent album, last year’s “Synthesis,” featured several new songs and newly arranged older Evanescence songs that feature orchestral accompaniment. Violinist Stirling’s self-titled 2012 debut album topped both the Billboard national Dance/Electronic Album Chart and the Billboard national Classical Album Chart, the latter for 21 consecutive weeks. She is featured on “Hi-Lo,” a song on Evanescence’s “Synthesis” album. Lindsey Stirling Violinist performed onstage at the 2016 Panorama NYC Festival at Randall's Island on July 22, 2016 in New York City. No information is available at this time about the size and makeup of the orchestra, or about who its conductor will be. Given the expense of putting dozens of classically trained musicians on the road for two months, it seems more likely the tour will hire members of area orchestras in each city.